The smell of rotten meat can permeate your entire home. 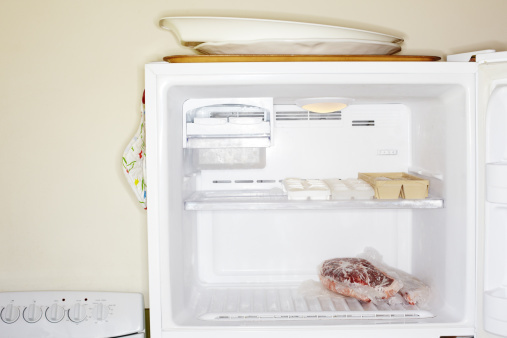 The refrigerator and freezer are the worst victims, along with your sense of smell. A forgotten grocery bag with a chicken may be lying in a corner somewhere or a piece of lamb may have gone bad in the refrigerator. Regardless of where the source of the rotten smell is, clearing away the noxious odor takes several steps. Your first task is to find the offending piece of meat and remove it from your home. Not just from the kitchen, but from the house. Take it to the curb in a plastic bag for garbage collection. Don't infect any interior garbage bins or your main garbage can. If trash day is several days away, put the rotten meat in a large freezer bag, fill it with ice cubes, tuck it into a cold-carry bag and then into a small cooler filled with ice. You may have to sacrifice the small cooler, but this is a piece of meat that has to be killed a second time. Put it outside, off the ground and covered with a tarp to prevent attracting critters. If you have a second freezer in your garage, the cooler can go in the freezer until trash day. Fill an empty sink with sudsy, hot water. Remove everything from the refrigerator and freezer, and wash the jars and storage containers in the hot water. Dry them then set them aside. For items that aren't sealed, wipe them with a cotton cloth dipped in the hot water. Set them outside -- not directly in the sun -- to dry. Put on rubber gloves. Mix one part bleach with three parts hot water. Using a cloth, wipe the insides of the refrigerator and freezer, including the shelves and storage cubicles. Dry with a dry towel. Pour at least a cup of white vinegar into a bowl. Using a clean cloth, wipe down the refrigerator and freezer. Keep the doors open as the interior air-dries. The smell of the vinegar may replace that of the rotten meat, but it disappears quickly. Fill several flat plates with unused coffee grounds and spread the plates around the interior. Baking soda or bowls of vinegar or vanilla extract also work, as does chlorophyll-based kitty litter or charcoal. Close the doors and wait several days. Replace the odor-eaters daily. It may take several days for the odor to go away, but it will. When it's safe to enter the refrigerator/freezer again, slice a lemon in two and rub the fleshy side along the walls, inside the crispers and on the insides of the doors. Do not wipe away the juice. If you can access the drip pan, remove and clean it. Meat juices may have dripped down and all of your work will be for naught if you don't get rid of the smell. The smell of rotting meat may permeate the entire house, especially if the odor roamed through the house for days. Fabrics especially are vulnerable to odors as are carpets. Open the windows and doors to let the odor escape. Turn your cooling system's fan on to move the air. When home, light scented candles, especially a chef's candle designed to eliminate cooking smells. Wash the drapes or have them dry-cleaned. Using a damp cloth dipped in an odor-chasing solution, wipe the furniture and let it air-dry. Steam clean the carpet with a water and vinegar solution. Fill dishes with coffee grounds, charcoal, vanilla, baking soda or chlorophyll kitty litter and distribute them throughout the house. Replenish them daily until the odor is gone.